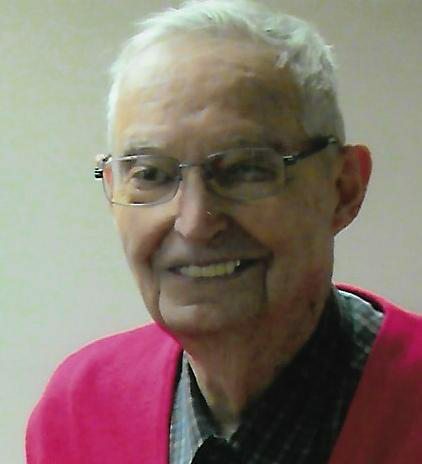 Jack Gaunt, 93, of Marshalltown, Iowa passed away on Thursday, September 14, 2017, at the Southridge Nursing & Rehab Center and also under the care of Iowa River Hospice. Funeral services will be held at 11:00 a.m. on Tuesday, September 19, 2017 at the Mitchell Family Funeral Home in Marshalltown, Iowa. Visitation will be from 10:00 a.m. until service time. Memorials may be directed to the Iowa River Hospice Home. Military Honors will be provided by the combined VFW/American Legion Honor Guard. Jack Owen Gaunt was born on December 4, 1923 in Marshalltown, Iowa; he was the youngest of six children born to William Merritt Gaunt and Susie (Richards) Gaunt. Jack attended school in Le Grand and graduated with the class of 1941. He enlisted in the United States Navy in October of 1942 during WWII. He served in the South Pacific during the Solomon’s Campaign on Guadalcanal, New Georgia and Bougainville. On April 15, 1955, he married the love of his life Joyce Mayle, at the First Congregational Church, a beautiful young lady that had come from England to visit her sister in the United States. They were married for 61 years before she passed in 2016. Jack had worked at Lennox industries and retired after 39 years of faithful service. Left to cherish Jack’s memory are many nieces and nephews. In death Jack rejoins his parents, William and Susie Gaunt; his wife Joyce (2016); brother, Mahlon “Sparky” Gaunt; and four sisters, Lois Springer, Betty Smaha, Wilma Nichol and Mildred Powers. For condolences or questions please visit: www.mitchellfh.com or phone 641-844-1234. Mitchell Family Funeral Home is caring for Jack and his family.